Convicted Chinese spy Wenxia Man. A South Florida jury has convicted a naturalized Chinese-American born in China for attempting to steal jet engines that power the stealthy F-22 Raptor and the F-35 Joint Strike Fighter, as well as the F-16 Flying Falcon jet fighters that are superior to all operational fighters of China's People's Liberation Army Air Force. The U.S. Department of Justice (DoJ ) said the woman named Wenxia Man, aka Wency, 45, of San Diego, California, was found guilty of conspiring to export military weapons, equipment and technical data to the People's Republic of China. 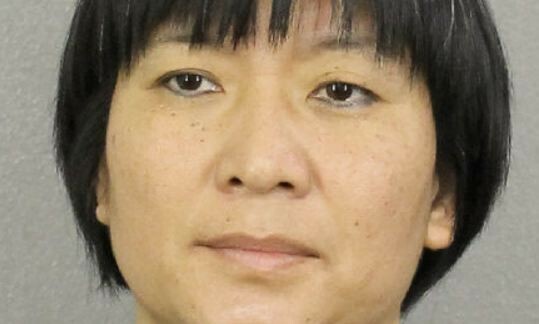 She was convicted of conspiring to evade U.S. export laws by illegally acquiring and trying to ship fighter jet engines and aerial drones to China. Wenxia tried to buy and export jet engines made by Pratt & Whitney and General Electric. Prosecutors said Wenxia worked with a partner, whom she described as a Chinese government "technology spy," to copy items obtained from other countries. She said this unidentified man was especially interested in stealth technology, according to the DoJ. She was also found to have tried to export a $50 million General Atomics drone to China, and technical data for the different hardware items. Wenxia will be sentenced in August and could spend up to 20 years in jail for violating the Arms Export Control Act. Wenxia's conviction is the latest in a continuing series of espionage cases in the U.S. involving spies working for the Chinese military or intelligence services. In March, a Chinese man pleaded guilty to cyber spying on Boeing and other U.S. firms. He hacked into their networks to steal sensitive information he attempted to send to China. The biggest stumbling block to modernizing the People's Liberation Army Air Force is China's inability to develop the sophisticated and high-powered engines necessary to power fifth generation stealth aircraft such as the F-22. China has allegedly tried to overcome this drawback by ramping-up espionage activities directed against U.S. aerospace firms and their contractors. China's newest five-year development plan identifies domestic development and production of engines and planes as a major goal. China's failure to develop engines at par with the best of the outside world can be seen in data that shows engines accounted for 30 percent of all imports to the country. Russian analysts have said the shortage of engines remains an obstacle to the development of China's aviation industry.